Love your local businesses . . .
Cupitt Jewellers is something of a Bromsgrove institution, with a well-deserved reputation for quality products and excellent service – and after almost 70 years in business, the family firm is looking to the future with some exciting new developments. One of Cupitt’s biggest assets is the presence of an on-site workshop, and this has recently re-opened, complete with a new resident jeweller. 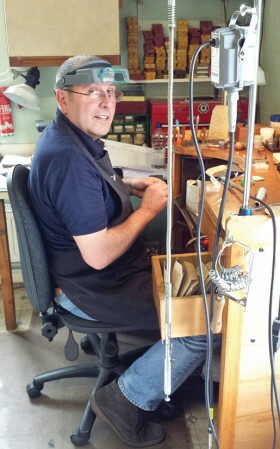 Keith Norton has worked in the jewellery industry for many years and brings a wealth of expertise – customers can trust him to repair or remodel their beloved jewellery or to create a specially-commissioned piece just for them. The shop itself has undergone a refurbishment and some new brands have been introduced, including beautiful silver jewellery by Birmingham-based Colette Waudby. Other popular brands include Endless, Coeur de Lion, Ti Sento, Diamonfire and Nomination, but Cupitt isn’t only about jewellery – the shop also stocks plenty of gift items such as watches, cufflinks, clocks and glassware, and a free gift wrapping service is available. Come along and learn more from Endless representatives, and check out everything else Cupitt has to offer!